Fleer is bringing the excitement of NBA Draft Day right into your home, literally! Found inside Fleer's 2003-04 Flair Final Edition NBA trading card set will be a card redeemable for NBA Draft Day Memorabilia, a one-of-a-kind framed piece you need to see to believe. Fleer has taken the actual items used in the 2003 Lottery Selection and the 2003 NBA Draft and framed them together to make a true one of one piece. 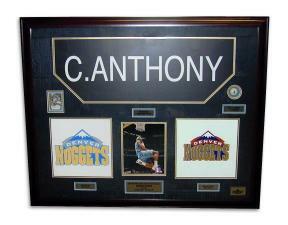 Each framed piece contains the lottery ping pong ball and the team logo placard from the Lottery Selection show, along with the player's name and team logo placard from the actual 2003 NBA Draft. The 2003 NBA Draft Class is considered to be one of the best of all time and these collectible one of one items are expected to draw a great deal of attention. There are eight (8) total players available for redemption. The checklist of players include: Carmelo Anthony, Chris Bosh, Dwyane Wade, Chris Kaman, Mike Sweetney, Jarvis Hayes, Mickael Pietrus and Marcus Banks. "With Draft Day Memorabilia, we have developed a truly innovative trading card memorabilia program that has never been seen before," said Fleer spokesman Joshua Perlman. "We feel that this type of program offers collectors pieces of history that are usually unattainable to the general fan." Fleer Trading Cards also has the exclusive rights to items used in the upcoming 2004 NBA Draft on June 24, 2004. These items will be incorporated into a 2004-05 Fleer NBA Trading Card product. 2003-04 Flair Final Edition NBA releases on June 23, 2004.